Kaushal Silva’s long overdue but timely Test century which came after 24 innings in almost a year has placed Sri Lanka in a position where they could press for a series sweeping win over Australia in the third and final Test at the SSC grounds. Australian wicket-keeper Peter Nevill and close-in fielder David Warner successfully appeal for a catch behind the wicket of Kusal Perera for 24. 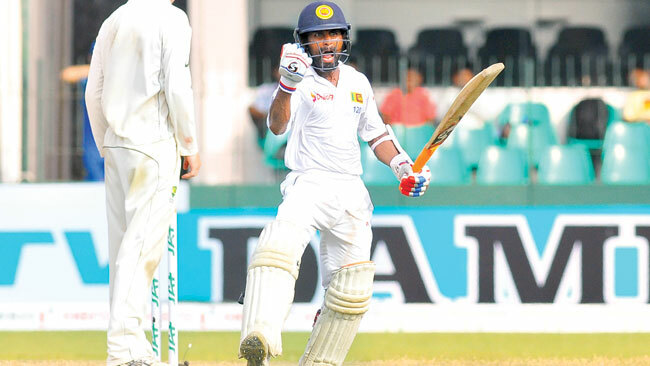 Silva labeled a dawdler for his slow scoring and under the microscope for not fulfilling his position as an opener with only 17 runs in the series prior to yesterday’s knock, got his act together to carve out his third Test century to enable Sri Lanka end the fourth day on 312 for eight wickets – an overall lead of 288. Silva was the bulwark in which Sri Lanka built their crucial overall lead over Australia as they searched for a rare 3-0 whitewash of the series. The diminutive opener playing on his home turf and with six stitches in his left-hand as a result of a split webbing between small and ring fingers battled it out for six hours to score a chanceless 115 and eventually place his team in a winning position. Silva survived two reviews for lbw at 14 against Nathan Lyon which he was successful and at 26 when Australia were unsuccessful when he got an inside edge onto his pads. Otherwise Silva batted freely to hit 10 fours in his 269-ball knock. The most productive of the partnerships was 90 for the sixth wicket between Silva and Dinesh Chandimal (43). 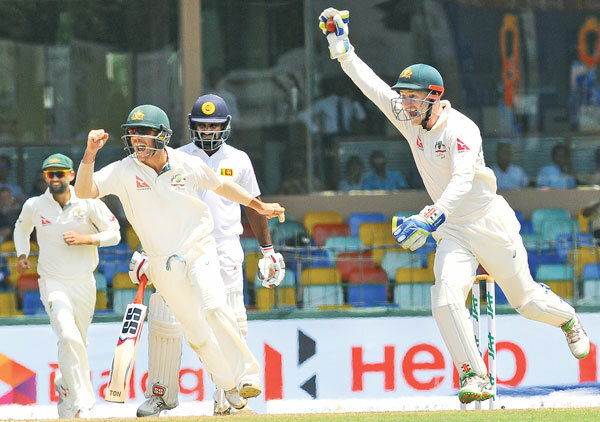 Although Australia chipped away at the wickets Silva’s well-paced innings denied them the opportunity of bowling Sri Lanka out by the end of the day and setting themselves up for a face-saving run chase today. That six of the eight wickets to fall were taken by spinners Nathan Lyon and Jon Holland gives an indication as to how the pitch is playing. It’s not an easy pitch to bat on and the spinners are going to have a big say on the fifth and final day. Australia managed to grab four Sri Lanka wickets in the first two sessions with Mitchell Starc becoming the most successful non-Asian bowler in a series in the subcontinent when he took his tally to 24 wickets by trapping Kusal Mendis lbw for 18. Starc broke New Zealand legend Richard Hadlee’s record for the most number of wickets by a non-Asian pace bowler in Asia. Hadlee had 23 wickets in 3 Tests against Sri Lanka in 1984 and another fast bowler Brett Schultz of South Africa took 20 wickets in 3 Tests also against Sri Lanka in 1993. Dimuth Karunaratne escaped the ignominy of falling to Starc for the sixth successive occasion in the series when he was out to Lyon. Karunaratne in actual fact gifted his wicket at 22 when he unconsciously lifted his left foot after being beaten by a ripper from Lyon and wicket-keeper Peter Nevill holding onto the ball longer than usual did the rest. At the wickets are Dhananjaya de Silva on 44 and Suranga Lakmal (0) and Sri Lanka will be looking to build on their lead to shut out Australia from the match although there is not much batting left.